Thanks to the amazing talent of one of our lovely colleagues, we have some excellent artwork to share with you. Please join us as we tell you epic carpet cleaning, stain removal and even water damage tales. We start our series with the story of Amanda. Amanda spent the summer with her two children. On sunny nice days, they played in the park, swam in the pool and enjoyed long picnics on the country side. But on cool, rain filled days, the kids and Amanda spent time at home. They would cuddle up for movies and popcorn on the couch and build forts in the living room. At the end of the summer, when the kids went back to school, Amanda looked around her house and found evidence of their summertime fun. Unfortunately, not only did she and her children make beautiful memories, they also made quite the mess. Amanda found grease stains in her furniture, sand in her area rugs and sticky, smelly messes in her carpets. 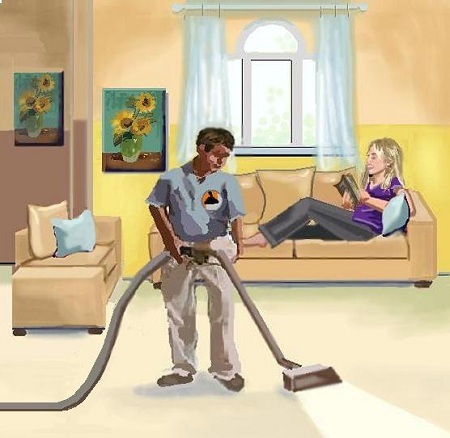 So as not to let the messes disturb her down time (or the wonderful memories made with her children), Amanda called Flat Rate Carpet for a cleaning service that included carpet cleaning, rug cleaning and upholstery cleaning. When the technicians finished her couch cleaning, she sat back and caught up with a good book. And after the technician removed the messy evidence, she thought peacefully, “Thank you, Flat Rate Carpet”.